Despite the advent of summer rains, we’ve been having our fair share of sunny days here in The Netherlands. Sunshine is always a good thing–regardless that I tend to get all sneezy and puffy-eyed from hay fever. It’s still good to open the doors wide and to look out at the sunshine. It’s also great to not have to put on a coat each time I leave the house. 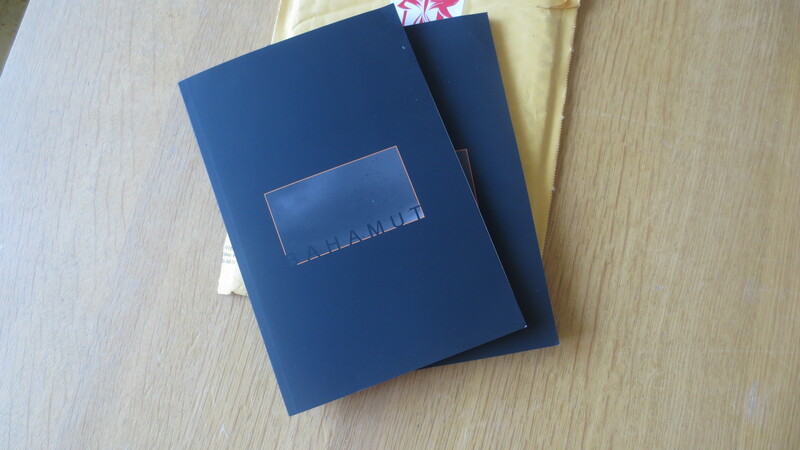 My Bahamut Journal author copies arrived in the late part of last week–it’s a pretty slick looking journal and I love being part of this publication. I’m sharing pics here and encouraging folks to go check out Bahamut Journal’s website. Bagi, which I wrote about in an earlier blog entry is in this issue. I’m very pleased. 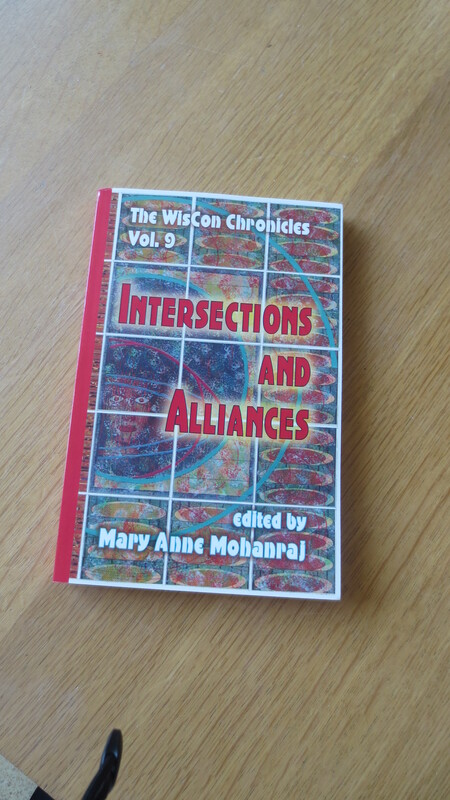 Today, the postman delivered my copy of Wiscon Chronicles 9 edited by Mary Anne Mohanraj. I’m delighted to have two of my essays included in this publication–more so because it’s been a dream to be published by Aqueduct press. The pub itself is a beauty and I love that I get to bask in all the non-fiction goodness–challenging and thoughtful work is necessary as we move forward and Aqueduct press continues to be one of my go-to places for thought-provoking reading. After close to a year of not doing anything much in terms of submission, I’ve gathered up my courage and resumed the task of sending out work again. Getting stories out the door has helped to boost my morale and made me feel like I can do this again. It’s June and Bahamut Journal’s first issue is now available for purchase. There are stories and there are stories, but Bagi (included in this issue of Bahamut) is a marker for me when it comes to delving deeper into the heart of story. I wrote this post to provide a little bit of insight into what went into the writing of this piece. I remember when I lost fluency in the use of my childhood tongue. We had just moved to Manila from the mountains and our parents had chosen to enroll my sister and I in an exclusive school. You know how you have those schools where kids come from the same social circles, grew up in the same exclusive neighborhood and went to the same kindergarten? It was that kind of school. It was a school that projected the image of: all our students come from high class families. My sister and I were admitted as partial scholars because we both scored high on entrance exams. We were picked up by a schoolbus, and while we didn’t have a house in one of the exclusive gated subdivisions, at least we lived in a subdivision. Not well-off but at least middle class. Unfortunately, we didn’t speak tagalog very well and no one spoke Ilocano or Ifugao with us. Not even the one student who had moved to Manila from Baguio City. Our saving grace was the fact that we could both speak English that was clearly not provincial English. As time passed, I realized that speaking English was the one way to be acknowledged and accepted somehow. Slowly but surely, I forgot all about Ilocano. By the time we graduated from highschool, I spoke Tagalog and English…mostly English because that was the posh language to speak. I find myself thinking these days of what gets lost when we lose a language. As I grow older, I find myself yearning for more fluency in the native tongues. To be able to speak without fear of stumbling over words, to be able to burst into conversation with childhood friends on Facebook or on twitter. To say things that can only be expressed fully in the language that feels closer to my skin. I feel language bubbling just beneath my tongue, but I am often afraid because I have not exercised it for such a long time. This is how I started writing Bagi: Ada ti Istorya. Bagi is the word for body. I was drawn to the fact that Bagi contains the same letters as biag which means life. I liked how these two words spoke to each other and thinking about these words, Bagi : Ada ti Istorya came into being. Writing Bagi was also a physical experience. There are stories that you draw from the air, there are stories you draw from things that have happened or from other stories that inspire you, and there are stories that you draw from deep inside your body. Bagi, inevitably draws from the body. As I wrote about trauma, I was going through an escalation of chronic and psychological pain. At one point, I was writing with only one hand on the keyboard as I could barely move my other arm because of the pain coming from inflamed joints. By Loncon, I had written more than 2000 words, I still did not have an ending and I worried that I would not finish the work because my head was filled with many other things. Then, came end of August and the Rainy Writers Retreat. In the company of beloved women friends, I finally was able to write the ending passage to Bagi. It was like descending into the deep and then coming up utterly changed. I think of the ways in which we sustain and support each other and I remember that story comes into being within the collective. I think of how being within the collective, being supported and surrounded by the warmth and the light of beloved ones, women and friends, precious faces, dear hearts, I think of how being within that collective enabled me to complete the circle of Bagi. This to me is the joy of the work. It comes into being from some deep and hidden part and blossoms into the life as it is watered by the circle of true comrades. Bagi: Ada ti Istorya shares a toc with other amazing authors for Bahamut Journal’s first issue (now available for purchase). My thanks to Darin Bradley and to Rima Abunasser for their support and encouragement, to Nisi Shawl who told me to submit work to Bahamut, to Nick Wood who provided me non-Ilocano speaker feedback, to my beloved friends, fellow Pinay writers and the circle of women. It is an honor to know that I’ll be able to share this work with you. **I didn’t have time to blog about it, but Lightspeed Magazine reprinted my PSF 6 story. Breaking the Spell is now available on their website along with an author spotlight where I talk a bit about what went into that story. You can also purchase a copy of the entire issue. **A bit late with this announcement as well. The movements column on Use of Anger can now be read on Strange Horizons. First of all, Lightspeed’s May issue is out and Breaking the Spell is appearing in it as a reprint. I’m delighted to share this story with more readers as it’s one of my personal favorites. I also wanted to share this bit of joy that came to me at the end of a difficult week. Yesterday, I went walking in The Hague with a friend and we found ourselves in an artist’s atelier. 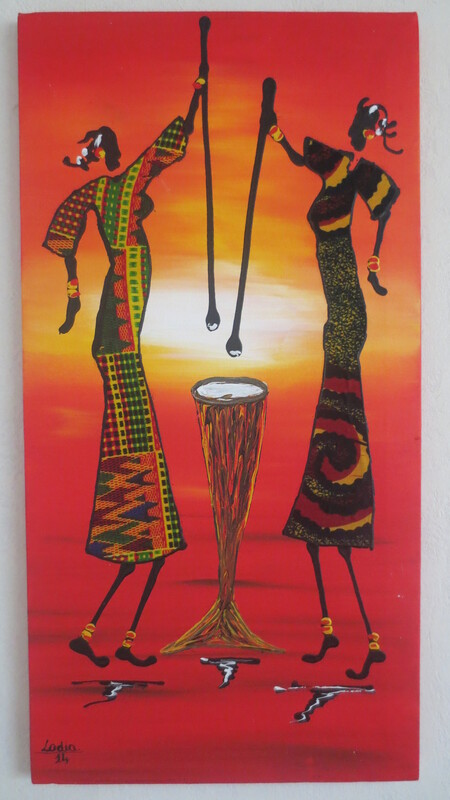 The artist, Ibrahim Lodia Diallo, was there and took time to talk to us about his art and the work he does. 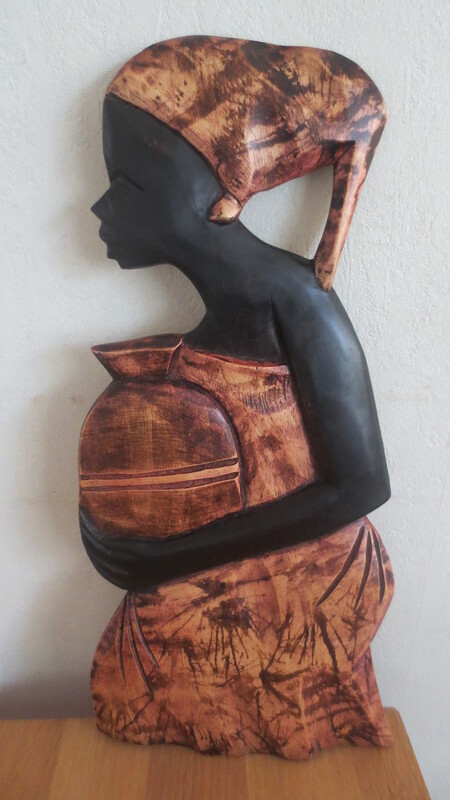 Today, I went back to the artist’s atelier to pick up the carving that captured my eye. I also brought home an exuberant painting that made me want to jump with joy. In conversation with the artist, he said: when you make art, you make it from your spirit. There is no need to worry about who will buy it or who you are making this art for, because the art you are making is meant for someone. Sometimes, it takes a long time before a piece of art finds its proper owner. He told me about a painting that had been hanging in his atelier for three years before its owner found it. This is art, he said. You don’t have to stress about it or make it fit with people’s expectations. You make art from your connection with where art comes from. I think of how the work that digs deep comes from that place and I find myself thinking of a panel at Loncon where I sheepishly admitted to not adjusting the work or even thinking about the reader when I write. But I think that there is always someone out there who the work is meant for. I don’t need to compromise my vision in order to fit into what the world sees as proper narrative. I am able to do this now after spending years in training, after honing craft and use of language and understanding what it is that really matters to me. I continue to learn. I continue to explore. I also am keeping hold of the truth that there is no room for fear when we embrace the work. I’ve hung up the painting over our table and will hang up the carving over my desk. Tangible reminders to embrace the work without fear and to keep walking forward with hope, with expectation and with joy. I dream of a future. It may not be everybody’s dream, but that dream future is mine. It’s a future I may not live to see, but it’s a future that I long to be. Yesterday, I joined the chairman of the board of the org I work for at an event hosted by Stichting ZAMI. I had been cloistered in the house for quite a while and have been finding it difficult to leave the safety of my four walls, so she had to practically force me to get a ticket and go with her. Well, she didn’t drag me out of the house, but an older Filipina woman who is like family can be forceful in ways that don’t require any physical exertion. In the end, I was glad that I went along with her because not only did I get to meet twitter buddy and all around awesome woman, Nancy Jouwe, but I also got to meet a whole bunch of awesome women. The conversations were positive and uplifting and listening to the speeches, the panel discussion and just engaging in conversation with these women was so inspiring and heartwarming that I came home feeling energized and strengthened and also more able to face the ugly truths about my own self. I was most moved by Fatima Elatik‘s closing speech where she told us about her own experiences in the political arena. She reminded us, that facing the truth about ourselves, acknowledging our own weaknesses and embracing those weaknesses make us stronger. I had been feeling very badly about my lack of insight and about the fact that I’d allowed myself to ignore and break my own principles in certain matters and I had been beating down on myself a lot, but Fatima said: What else can you do? You just have to acknowledge that you have weaknesses. You’re not perfect. You’re only human. You fail. The important thing is to realize that the fails you did were things from yesterday and then you have to move on. You have to understand that the work you’re doing and the work you’ve undertaken to do is more important than the fact that people are talking about you and not everyone likes you. Looking at the way the system works ( particularly in publishing ), I don’t believe that gatekeepers are there to keep out diverse works or that gatekeepers aren’t interested in diverse work. One speaker said that it was to us to figure out our position in relation to the system. Gatekeepers don’t know how to do diversity work, but we who know how to do the work need to keep doing our work. We need to keep raising our voices on the need for diversity, but (and in particularly this is for PoC and non-western folks) we need to strategize in order for the system to work for us. So, how do we do that? We do that by creating work that cannot be ignored. What are the things that we carry with us that will show the industry that they are the ones who need us? Instead of begging for scraps, we need to stand firm and take control of ourselves and of our work. We show them what we can contribute and how we can contribute towards building a system that is truly diverse and inclusive. This is our work. Publishing our work brings something to the publishing industry that it didn’t have before. Diversity brings color and life to the book industry. Diverse work enriches readers because through reading about places and cultures that they don’t have access to, readers learn to be more understanding. Books teach us many things. They tell us stories that help us empathize with people from places we’ve never been to. Hopefully they teach us to be more mindful of each other and more understanding of the fact that despite our best intentions, we are all still human and we need each other on this journey. More than ever, I’m convinced that we don’t need to adjust or apologize for the stories we tell or for how we tell them. These are narratives that the world needs. We tell them our way because no one has heard them told the way we tell those stories. Publishing needs us more than we need them and the way I see it, it’s up to us to make ourselves visible and show publishing that they just can’t go on without the presence of a diverse list of writers coming from different cultures and different places around the world. Keep sending those stories out and keep writing them. You can do it. I’ve been so behind on many things and I still want to write a report on the conventions that I attended. The second installment of the Movements column on Translations, Mother Tongue and Acts of Resistance has been published over at Strange Horizons and if you haven’t read it yet, do take the time to check it out. I love how the conversations around translation and the conversations around use of language tie in with the vision for a more inclusive and diverse science fiction–with a vision of the sky that is so wide and broad that all of us fit into it. 2014 has been a really hard year on the SF community. We’ve lost a number of brilliant minds too soon and it fills me with sorrow to think of the conversations and the stories that are now taken away from us. There is a huge gap where these beloved writers have been and I wonder–who will come to fill in the gap and will those who fill in the gap be as generous and big hearted as those who left it behind? While I didn’t know most of these writers, I knew them through their work and through the thoughtfulness of the work. I am thankful for the memorials that give me more insight into the spirit of these writers. Not only does it make me understand them better, it makes me also appreciate them more. I think of the generosity and warmth that I have always received from the science fiction community and while we have our moments, I continue to be hopeful and to believe in the future. I find myself thinking of how no matter what awards or accolades we may gain in life, what matters is the memory that we leave behind. What kind of memories will people have of us? What relationships have we nurtured and built up? How have we given back or given forward? I’ll elaborate on this more in a future blogpost, but for now, I wanted to leave this here as a reminder. *Part one of the column on translations is here. Movements: Translations, the Mother Tongue and Acts of Resistance is now live on Strange Horizons. Elisabeth Vonarburg’s The Chambered Nautilus also appears in this issue. It’s my first time to read her and I’m so glad Aliette de Bodard chose her story for this curated issue. You can read Aliette’s introduction here. In the same issue is an essay by Jaymee Goh: Once More with Feeling: A Belated Response. Fellow Filipino writer, Victor Ocampo has a new story up at Apex Magazine. Blessed are the Hungry is an interesting work which also breaks language hegemony and demonstrates code written into story. I like how it references a famous Filipino movie by Ismael Bernal. Apex Magazine’s July issue is filled with interesting reading provides the reader with an interesting and diverse line-up. I quite enjoyed Rose Lemberg’s Baba Yaga Tries to Donate Money. Benjanun Sriduangkaew’s novelette, Courtship in the Country of the Machine Gods, also appears in this issue as a reprint. The Apex Book of World SF 3 edited by Lavie Tidhar features this novelette and is now available. Of the stories published in Clarkesworld Magazine, I’ve only read N.K. Jemisin’s Stone Hunger. I like how the story makes use of the fairytale frame, the familiar becoming unfamiliar, it’s a story I want to read again at more leisure. I’m working slowly through a post on the Decolonization process and Science Fiction. At the moment I have so many words on the page and I need to group them together so they form a cohesive whole. Lately, I’ve been reading Leny M. Strobel, Virgil Mayor Apostol and Barbara Jane Reyes. Artists, writers, culture bearers. Cristina Jurado interviewed me for El Fantascopio and the interview has gone live. You can read it in Spanish here and in English here. It’s heartwarming to find out that readers in Spain have also read some of my work and I want to thank Cristina and El Fantascopio for thinking of me and for taking the time to interview me. The latest installment of my Movements column, Brown Woman at Work, was published on Strange Horizons. I write about navigating the waters of being a writing mother in a conservative Dutch community and how important it is to write truthfully. I was thinking about process and how I write and why I am unable to bring myself to write to a formula. I tweeted about how writing these columns feels like going naked and Kate Elliott tweeted back and reminded me that all writing that matters is a little bit naked. I want to always approach my work in a mindful way–writing what I believe in and writing truthfully. Some truths are very hard to write about and there are some truths that I still struggle with, but I am getting there. I’ve updated the book blog with the long-delayed publication of Wesley Chu’s interview. I’m missing the collaboration that I had with my big sister and I’m really sorry that she’s had to bow out of reviewing. I have a few more interviews on file and after I post those, I think the book blog will change into a reading blog where I talk about books and short fiction that I’ve read. There’s been little time to update this blog and so I’m sharing a clump of news in this one post. For one, I’m finally able to announce that my Bloodchildren story, Dancing in the Shadow of the Once, will be appearing in the Mammoth Book of SF by Women edited by Alex Dally MacFarlane. Dancing in the Shadow of the Once is one of the stories that I’m proudest of. When the email came in, I jumped up and down with joy and that happiness has kept me going throughout the dark months. The Hugo shortlist for 2014 has been announced and I’m tickled pink to see that Speculative Fiction 2012: The Best Online Reviews, Essays and Commentary edited by Justin Landon and Jared Shurin is a finalist for Best Related Work. My essay, Decolonizing as an SF Writer, is in this volume. You can read the essay here, but you can also purchase a copy of the book and read all the goodness inside. All proceeds from sales go to Room to Read. The shortlist for the Shirley Jackson Awards has also been announced and Jonathan Oliver’s The End of the Road anthology has been shortlisted for best Anthology. Jonathan Oliver put a lot of work into making this an anthology that’s inclusive and diverse and I’m very pleased to see the anthology receiving recognition from his peers. Also, secretly tickled because Dagiti Timayap Garda is in this anthology and in a way, I feel like Ifugao has now been put on the genre map. There’s still quite a bit to post, but I’ll keep that for another time. In the meantime, I wanted to share this piece of art created by James Ng. 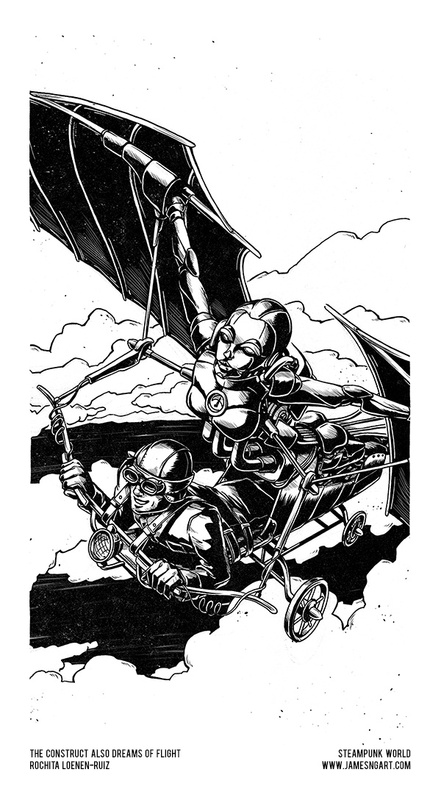 I’m completely blown away by how this image that he’s created for my short story, The Construct Also Dreams of Flight which is in the upcoming Steampunk World anthology edited by Sarah Hans. Do check out the hashtag #SteamPunkWorld or check out https://twitter.com/jamesngart for more SteamPunk World interior art. 2014 is turning out to be quite a busy period. Aside from familial things (including my eldest son breaking his leg and needing lots of support), I’ve been busily working on the En novel. Sometimes, I look at this work and worry about it being too different. When those moments arise, I remember Audre Lorde talking about the work being greater than the fear and I push on and persevere. This is a story I must write and so I’ll write it to the best of my abilities. Via my good friend, Aliette de Bodard, I found out about this lovely review of “Of Alternate Adventures and Memory”. I’m quite blown away to have my story mentioned alongside Sofia Samatar’s “Selkie Stories are for Losers”. I loved Sofia’s story, so it’s an honor to be mentioned in the same breath as her. Thank you, Ana Grilo. I want to keep on writing stories that will move readers. Stories that will make readers think and look differently at the world around them. Stories that will challenge readers to step outside the box and move beyond their comfort zones. I also want to continue to encourage other writers to keep on being courageous. No one else can tell your stories the way you do. I won’t be at many conventions this year, but I’ve been invited and agreed to be one of the guests at Fantasticon 2014. My thanks to Jesper Rugard for inviting me and to Trish Sullivan who kindly put my name forward. I’ve heard that it’s a great con and I’m looking forward to meeting new people and making new friends. While I was offline, the second part of A Poetics of Struggle was published on Strange Horizons. If you haven’t read it yet, it’s here. There’s still a lot more to say about struggle and the field of sf, but I’ll leave it there for the moment as the next column will be about something completely different. For today’s final bit of news, the ToC for Steampunk World edited by Sarah Hans has been announced. I think Sarah Hans has done a wonderful job of putting together an anthology which is true to the word “World”. I look forward to reading the stories and hope that readers enjoy reading them too. It seems like a long time ago that I wrote the hay(na)ku verse that led to the birth of Alternate Girl and Alternate Girl’s Expatriate Life. Of Alternate Adventures and Memory is a story set in the same universe as Alternate Girl’s Expatriate Life and it’s been published at Clarkesworld Magazine. Clarkesworld Magazine is one of the best publications in the SFF field today. It’s one of those publications that’s kept me hopeful and trusting about the future of science fiction and I’m honored to be in this issue. The December issue includes stories by E. Lily Yu, Benjanun Sriduangkaew, James Patrick Kelly and my Clarion West instructor, John Kessel. Do go and check it out when you have time.